Over the last few years I’ve had the pleasure of touring the Western United States and many of the great brewing companies that bespeckle the coast from Port Angeles to San Diego and everything in between. Today I’ll talk about the origins of Western-American breweries and why we should be grateful to our southern neighbours. Grant’s Brewpub in Yakima was widely considered to be the first of it’s kind in the United States. Founded in 1982 by a Scotsman named Bert Grant. Nobody had opened a modern brewpub since prohibition, making Bert Grant’s Real Ales a big deal. There wasn’t much of a market for craft beer, so Bert made a market for his beer with a hard work and a whole lot of character. Bert wore a kilt and danced around his pub, he kept a broadsword behind the bar for protection from surly drunks. In fact he loved good beer so much he carried a vial of hop oil in his pocket to liven up any bland-tasting glass of beer he came across. 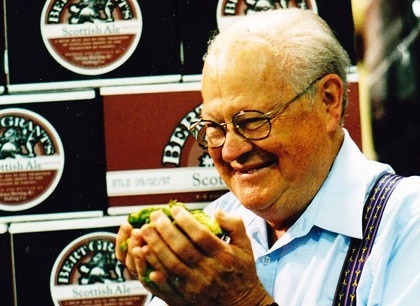 When questioned about the hoppiness of his Scottish Ale and whether or not it was true to the style, Bert simply replied “Of course it’s a Scottish Ale, I made it and I’m a Scot”. Yakima is a well-known fertile area of hops, but it’s history of pioneers like Bert Grant that should put Yakima on the map. Sadly, Bert’s brewpub and the brewing operation were closed for good in 2006, and more tragically, five years later Bert passed away in Vancouver. His memory lives on at Yakima Brewing Company where his original equipment is still used. Gordon Bowker is a name that can’t be omitted from a blog about coffee and beer (I swear, I do drink coffee). Chances are pretty good that Gordon has been responsible for putting a drink in your hand at some point. In 1971, along with some friends from University of San Francisco, Gordon opened a little known coffee shop in Seattle called Starbucks. Ten years later, he partnered with Paul Shipman in opening Red Hook Brewery, one of the first craft breweries in the Pacific Northwest. Despite the fact that Starbucks is now one of the biggest corporations in the world and Red Hook is 33% owned by Anheuser-Busch, respectively both were integral in laying foundation for the craft beer and quality coffee available to us today. Between washing machines and beer, luckily Fritz Maytag chose beer. Though it may be disputable that Fritz Maytag is the Godfather of the modern craft beer industry, but only just. Back in the early 1960’s Fritz and his buddies enjoyed tossing back Anchor Steam Ales at the local Spaghetti Factory. A bartendar informed them of the brewery’s imminent closure, so they decided to go for a tour and discovered that Anchor was run-down and about to close up shop. Nearing the end of his education days, he chose to go into the beer business and became a 51% owner of Anchor Brewing Company in 1965, instead of following his great-grandfather in the appliance business. Fritz ran with his passion for beer and by 1971, Anchor was brewing five types of beer. 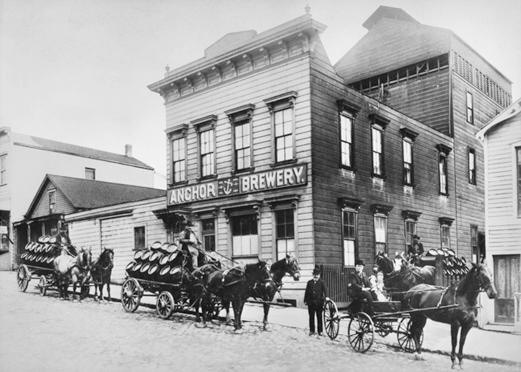 Anchor was a pioneer that opened the doors for other brewing companies that shot up all over California, and eventually across the US then quickly spreading into Canada. Anchor made the first wheat beer in North America since prohibition, and they were the first brewery in the world with an in-house distillery. Once again we find the Navy’s influence in pioneering beer for the rest of us. Jack McAuliffe was a submariner in the US Navy when he found himself Scotland in the early 1970’s drinking beer that tasted like nothing he’d ever had before, that is until returning home and getting a taste for fellow Californian Fritz Maytag’s beer. 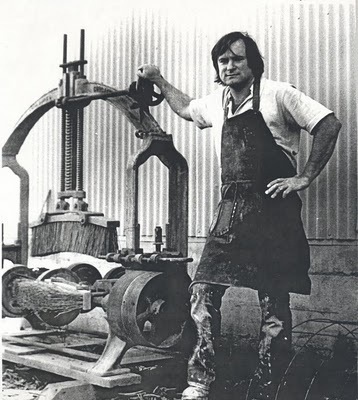 In 1976 Jack sought to set up his brewing operation in San Francisco, but ended up just a bit further North in Sonoma, California where he built everything from the ground up. His facility was a three-story building using gravity to carry the beer through the different processes. Everything was hand-built by Jack and New Albion Brewing company was born. With many successful beer formulas such as New Albion Ale and Old Toesucker, Jack found himself unable to keep up with demand and was unable to finance expansion, which eventually forced him to close operations. Jack’s pioneering and innovation made him a foundation in the American Renaissance of craft beer. Ken Grossman of Sierra Nevada Brewing paid homage to Jack by inviting him to be a part of making Jack and Ken’s Ale, a celebration of two of the men who started it all. You may notice a significant geographical gap that has been omitted. A special report about the most-brewed state in the USA will be forth-coming. As the brewing capital of the world, Oregon is so extensive that it deserves it’s own post. These are just a few of the men who were integral in opening the doors to a future with good beer available to everyone across the United States. It wasn’t long before real ale found it’s way North of the border into Canada in 1984, when Paul Hadfield opened the doors to Canada’s first brewpub at Spinnakers. Wednesday, May 29th, a book launch will be held at Spinnakers Brewpub for Joe Wiebe’s “Craft Beer Revolution (The insider’s guide to BC Breweries)”. Be sure to check it out. I hope you’ve enjoyed today’s history lesson and will join me in raising a pint to our American friends with whom we share a love for real beer.